Download "Triple-play subscriptions to rocket to 400 mil." 1 Triple-play criptions to rocket to 400 mil. Global triple-play criptions will reach 400 million by 2017; up by nearly 300 million on the end-2011 total and up by 380 million on the 2007 total, according to a new report from Digital TV Research. Covering 80 countries, the 308-page Triple-Play Forecasts report estimates that the Asia Pacific region will contribute 257 million of the 2017 total; up by more than 200 million on the end-2011 total. China alone will have 193 million triple-play cribers by 2017 (with only 39 million recorded at end-2011) or 48% of the global total. 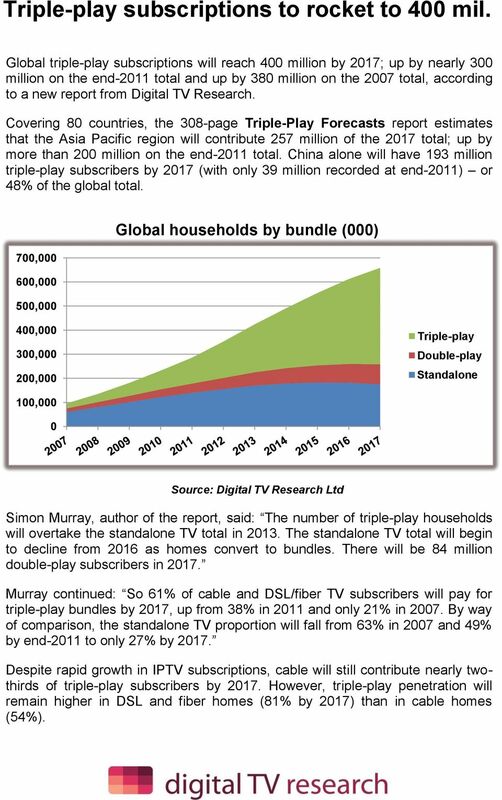 700, , ,000 Global households by bundle (000) 400, , ,000 Triple-play Double-play Standalone 100,000 0 Source: Digital TV Research Ltd Simon Murray, author of the report, said: The number of triple-play households will overtake the standalone TV total in The standalone TV total will begin to decline from 2016 as homes convert to bundles. 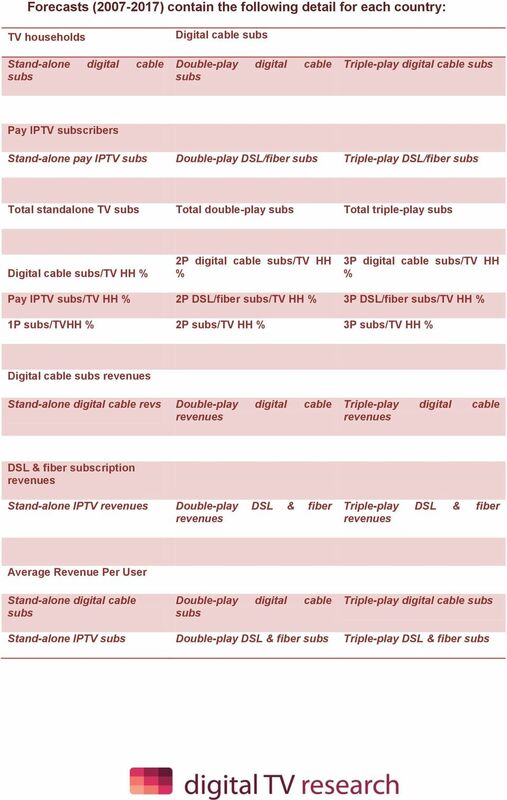 There will be 84 million double-play cribers in Murray continued: So 61% of cable and DSL/fiber TV cribers will pay for triple-play bundles by 2017, up from 38% in 2011 and only 21% in By way of comparison, the standalone TV proportion will fall from 63% in 2007 and 49% by end-2011 to only 27% by Despite rapid growth in IPTV criptions, cable will still contribute nearly twothirds of triple-play cribers by However, triple-play penetration will remain higher in DSL and fiber homes (81% by 2017) than in cable homes (54%). 2 This report defines triple-play as homes cribing to TV, broadband and fixed telephony services. Double-play is TV and broadband cribers. These are cribers to cable and DSL & fiber networks, so the figures exclude satellite TV providers (such as BSkyB in the United Kingdom) which supply triple-play and double-play bundles. More than a quarter of the world s TV households (covering 80 countries) will cribe to triple-play services by This is up from only 8% penetration at end-2011 and only 2% at end Proportions in 2017 will be highest in the Netherlands and Belgium (both with 64%), followed by Taiwan (60%) and Singapore (59%). 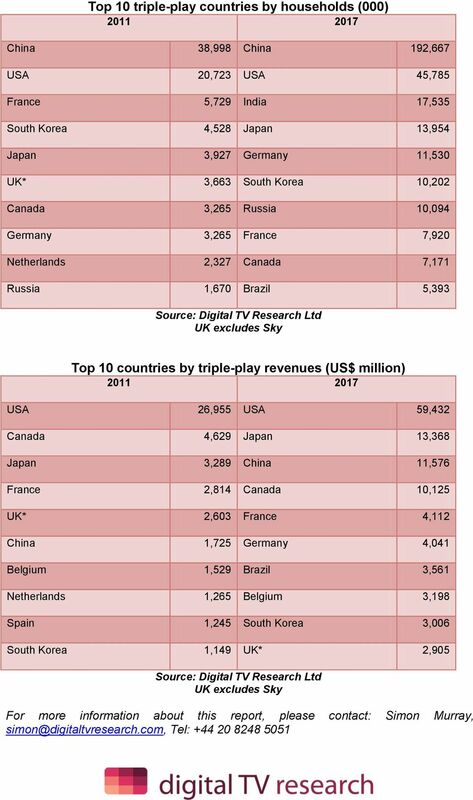 Eight countries will have more than 50% triple-play penetration by Triple-play cription will reach US$149 billion by The US (US$59 billion) will account for 40% of the world s triple-play by 2017, followed by Japan (US$13 billion), China (US$12 billion) and Canada (US$10 billion). From the US$93 billion to be added between 2011 and 2017, the US will supply US$32 billion, with Japan and China each up by US$10 billion. 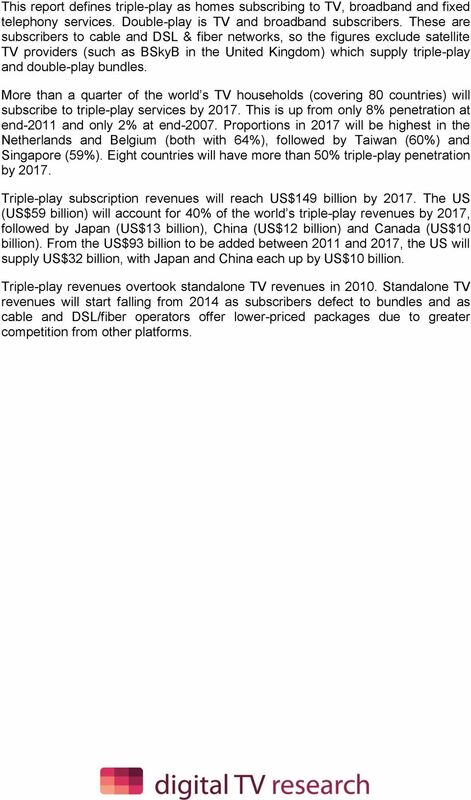 Triple-play overtook standalone TV in Standalone TV will start falling from 2014 as cribers defect to bundles and as cable and DSL/fiber operators offer lower-priced packages due to greater competition from other platforms. 4 Triple-Play Forecasts: Table of Contents Published in August 2012, this 308-page electronically-delivered report comes in three parts: A 114-page PDF giving a global executive summary and comparison tables. 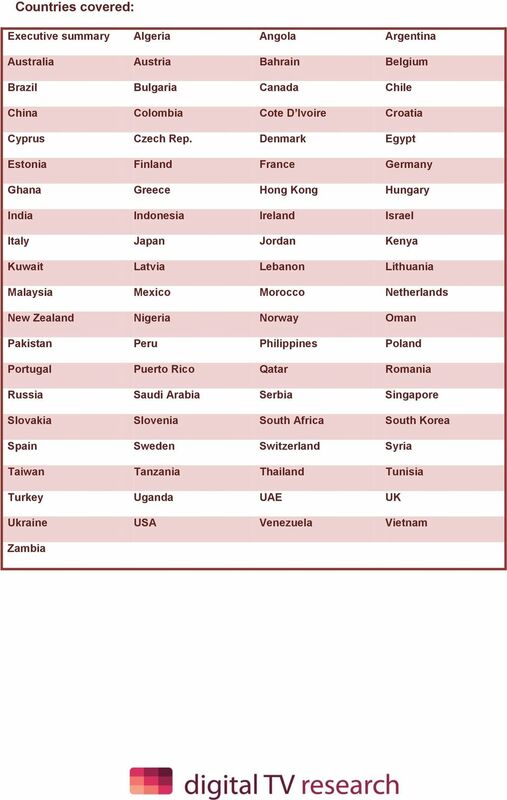 An 82-page PDF giving country-by-country forecasts in detail for 80 territories. An excel workbook providing triple-play data from 2007 to 2017 for 80 countries as well as handy comparative tables.